One of the most painstaking exercises in mine planning is the ability to produce fast but meaningful scheduling scenarios that can actually be achieved on site for short, medium and long term planning. Spry Scheduler gives the power to the engineers by being able to produce visual representation of your mine schedule faster than any other scheduler package on the market. The ability to schedule fast and visually provides insight and a powerful way to communicate your plan to your teams. 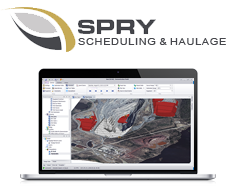 Spry can utilize data from a range of mine planning packages used throughout the world. Public training courses for Spry users are now available. Register online here or email us for a custom training!